When you get a migraine or splitting headache, you are not yourself. You want fast, effective relief so you can quickly get back to normal… whatever your normal is. Dosage: Adult use only (12 years and older): Take 1 tablet every 4 – 6 hours. If pain does not respond to 1 tablet, take 2 tablets at next dose. Do not take more than 8 tablets per day. Caution: Keep out of the reach of children. This package contains enough drug to seriously harm a child. Avoid other caffeine containing products. Too much caffeine may cause rapid heart rate, nervousness or sleeplessness. Ask a doctor or pharmacist before use if you have high blood pressure, glaucoma, or overactive bladder syndrome. Do not use with other drugs containing acetaminophen. Use the smallest effective dose. Do not take more than the maximum daily dose. Overdose may result in severe or possibly fatal liver damage. Do not take if allergic to acetaminophen. Consult a doctor if: Your symptoms last for more than 5 days; You develop allergic reactions such as wheezing, rash or itching. Ask a doctor or pharmacist before use if you: Are pregnant or breastfeeding; Have chronic alcoholism; Have a serious liver or kidney disease; Use any other medications including natural health products, prescription drugs, salicylates or other pain and fever relief medications. In case of overdose, call a Poison Control Centre or doctor immediately, even if you do not notice any possible signs or symptoms such as increased sweating, nausea, vomiting, stomach pain, and loss of appetite. Use only as directed by a doctor. WARNING: Do not use if carton is open or if printed bottle neck band or inner foil seal is broken. Store at room temperature, 15–30°C (59–86°F). Not sure why they call this "Ultra". For me, it seems to have the exact same effect as the traditional "Extra Strength Tylenol". All in all, it does it's job. 2 pills and my headaches are usually gone. The pricing, in my opinion, is a bit too high though. Like I said, it works the same as Extra Strength Tylenol so....not really worth the higher price. If you can get this for the same price as Extra Strength Tylenol, then by all means ge tthis. If you have to pay more, stick with Extra Strength Tylenol. Both you (and your wallet) will thank me. Make sure not to exceed 8 tabs a day. 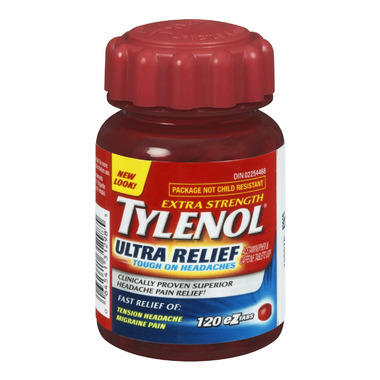 This product (Tylenol in general) can cause serious liver damage.